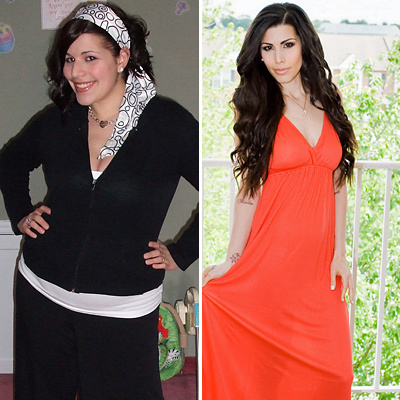 What was the “turning point” that prompted you to lose weight? 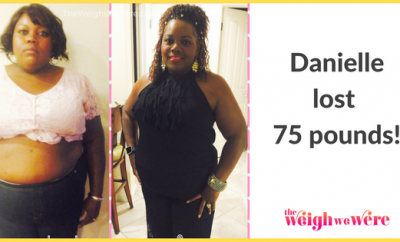 After I had my daughter, I realized that I was the heaviest that I had ever been. None of my clothes fit, and previous attempts to lose weight prior to my pregnancy weren’t successful. I knew that I needed to make a change — not only for myself, but to be healthy for my daughter’s sake. When did you start trying to lose weight? I started May 2007, about a month after I gave birth to my daughter, and I never looked back! I knew it was going to take something drastic to lose so much weight and keep it off, so I began to research how to live a healthier life. I started by re-assessing every aspect of my life. I kept a food journal and educated myself on different exercises to do when starting a weight loss journey. My food journal was a major eye opener to me, I had no idea how poorly I my diet had been. At first it was a lot of trial and error, however I did begin to see results. My biggest challenge was a combination of things regarding my workout. It was difficult to come up with the time to do a proper cardio workout with an infant daughter, I did not have any exercise equipment, and at the time I could not afford to join a gym. I relied solely on running up and down the steps in my home and taking jogs/runs at our local park. My husband would walk behind pushing our daughter in her stroller! Were there any times when you wanted to quit or give up? How did you stay motivated? I can honestly say that not once did I ever consider quitting. I felt better than ever. For the first time in my life, I was seeing such positive results in losing weight without the help of a diet pill or a fad diet. The changes I made to my lifestyle became a part of my everyday life, and I was doing it one hundred percent naturally. I stayed motivated by viewing each and every workout as one step closer to reaching my goal weight, and viewed any cheating on my eating routine to be a step backwards. When you think about how much hard work and energy goes into burning off weight, it made me not want to have that hard work to go to waste. If you reached a weight loss plateau, how did you break out of the rut? I did hit plateaus a few times during my weight loss journey. Each time I would reassess the exercises I was doing, as well as the things I was eating. I would try to change up my exercise routine to work different muscle groups, to keep my body moving in a positive direction. I also would change the input of certain nutrients to better balance out my diet. What’s your current exercise routine? Currently, I love to do Pilates, and I mix cardio in a few times a week. I have a full ab workout routine that I do every day to keep my core strong and toned. What’s your daily diet look like? I make just about all of my meals from scratch, so I can manage the nutritional content as closely as possible. Aside from having generous portions of fruit, I make my own low-carb waffles from scratch to have each morning. At lunch time, after my workout, I like to have a lunch that is high in protein (usually containing chicken) along with fresh fruit and veggies. I do just about the same for my dinner. I always say that a colorful plate will keep you in shape! I also enjoy my own homemade cakes and other dessert items for when I need a sweet fix. I received so many requests for my recipes them through my YouTube Channel that I decided to publish my own eCookbook, which is available on my website. What’s your favorite healthy snack/meal? My favorite snacks can vary from season to season. For the spring, I like fresh berries and melon with flavored green teas. For meals, I like chicken piccata and chicken quesadillas, which I have been able to make very figure friendly! Do you have specific suggestions for avoiding temptations? I get asked this question frequently through my website and YouTube channel. I answer by challenging the person to do some research and find a way to enjoy some the “downfall foods” by finding healthy variations or replacements for them. For example, I am obsessed with pizza, which we all know can be VERY unhealthy. I was able to develop some healthy pizza recipes that taste wonderful, but are low in fat and guilt! What’s your life like after weight loss? After I reached my weight loss goal, I didn’t even consider going back to the way I lived my life before. I was committed to the changes I had made to my lifestyle so strongly that those changes were now a part of my everyday life. Without trying, I continued to lose weight slowly until I reached the weight I am at now. I have continued to maintain to this day. My confidence levels increased dramatically; so much in fact, that I finally decided to start a YouTube channel (www.youtube.com/nancyvalentino) to showcase my love and talent for doing makeup. I eventually decided to share my 100 lb weight loss journey with my viewers in a video, and I had no idea how well received it would become. I received so much feedback from viewers about how inspiring and motivational my story was, I was truly moved. I decided to add healthy eating and healthy living videos to my channel, and it has really taken off. I have kind of earned the title of “The Figure Friendly Foodie”, one that I am proud of! Due to the overwhelming response from viewers interested in my weight loss story and recipes, I published an eBook titled “Embracing the Change”, which outlined my journey in detail including exercises and meal ideas. My follow up eBook titled “Maintaining the Change”, along with my eCookbook “The Figure Friendly Foodie’s Guide to Eating”, are available on my website, www.nancyvalentino.com. If you have any suggestions to others what would they be? I suppose my strongest suggestion would be to strongly commit to any weight loss you are trying to achieve, no matter how big or small. Without commitment, you are prone to fail. I know if may sound harsh, but it is true. You have to want it bad enough in order to be successful. Take a look deep down inside of yourself and find the motivation and drive to live each day committed to your goal. I always say that you can never allow yourself to have a “cheat day,” whether it be exercising or eating healthy. You wouldn’t cheat on your spouse or significant other would you? So why would you be willing to cheat on yourself? Because cheating on yourself is what you are doing if you let yourself slip just one time while on your weight loss journey. Finally I implore that you lose the weight for yourself and for no one else. You are your greatest motivator, and you will reap the rewards when you attain your goal. Way more beautiful than Kim k. But I did have to do a double take myself. Wow Nancy very good I am impressed. Good interview, I love that she was very detailed and I plan to look her up on YouTube!!! You looked beautiful before as well…. Totes thought the after was Kim K for a second. Great job!